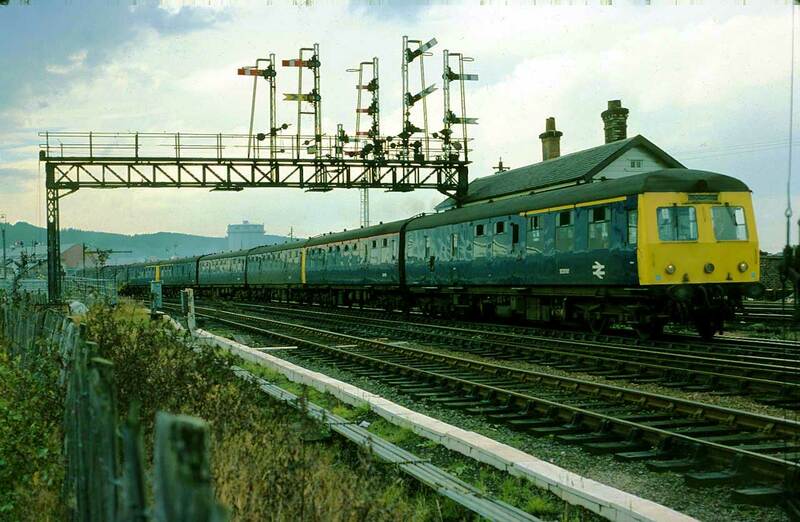 There were three distinct variants of Swindon built Diesel Multiple Units used in Scotland and a great deal of misconception still seems to exist as to where each of the three types operated. 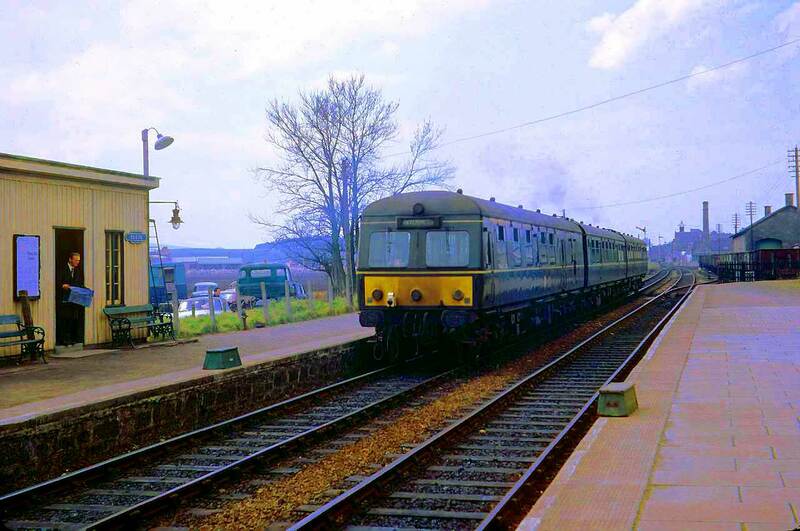 The Swindon DMU's that were used on each route may at first appear to be similar but by no means were they identical. 1. Edinburgh Waverley to Glasgow Queen Street. 3. Glasgow St. Enoch and Glasgow Central to Ayr and Stranraer. 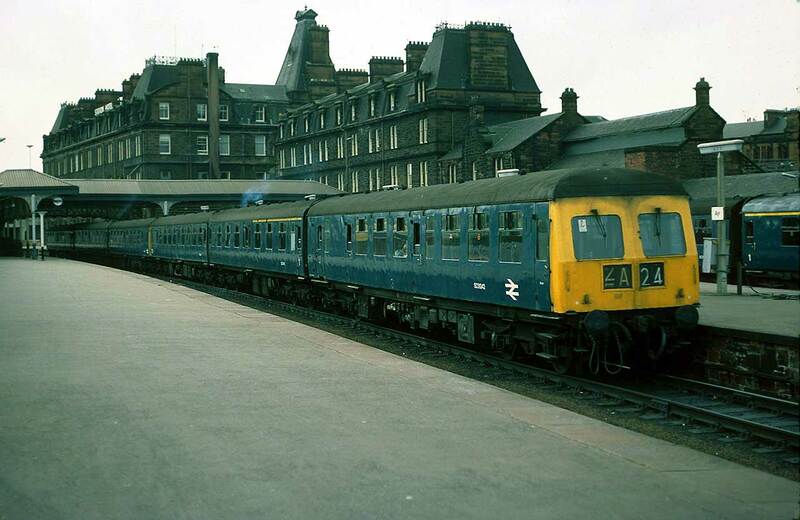 The first units built in 1956-57 were on the Edinburgh-Glasgow route. These trains generally ran in a semi constant formation of six vehicles but vehicles could be substituted. A typical formation would have the leading vehicle as a Driving Motor Brake Second (79091-94, 79096-111), which had a full width cab and a small guard's van immediately behind the cab and seating for 52. Vehicle two was an Intermediate Driving Motor Brake Second (79083-90, 95) and also had a small guard's van immediately behind the cab. This vehicle was gangwayed at both ends and also had seating for 52. Alternatively, the second vehicle was an Intermediate Driving Motor Second with seating for 64 (79155-68). Depending on which way around the train was oriented, the third vehicle would be a Trailer Corridor Buffet First (79440-47), which had three first class compartments with seating for 18 and an additional 12 seats in the buffet area. Vehicle four was a Trailer Corridor First (79470-82) with seven compartments and 42 seats or a Trailer Composite Corridor (59402-12) with seating of 18 first and 24 second. Vehicle five would be similar to vehicle two and the last vehicle was the same as the first. The route indicators on the cabs were of the stencil type. 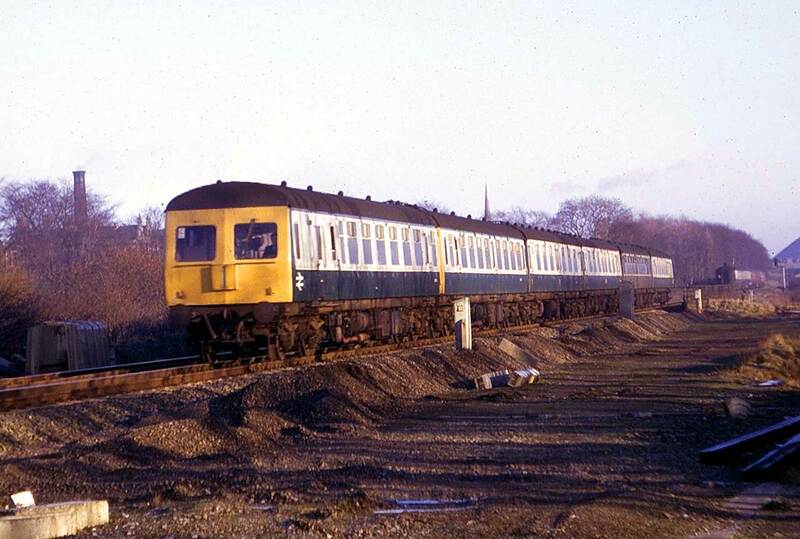 These trains remained in service until superseded by the Class 27/1's, 27/2's and dedicated sets of Mk. 2 coaches in the early 1970's. After removal from the Edinburgh Glasgow route, all but two of the Edinburgh Glasgow Swindon motor vehicles were withdrawn from service in the UK. The exception was Intermediate Driving Motor Brake Second (79088) with 52 seats and Intermediate Driving Motor Second (79168) with 64 seats. 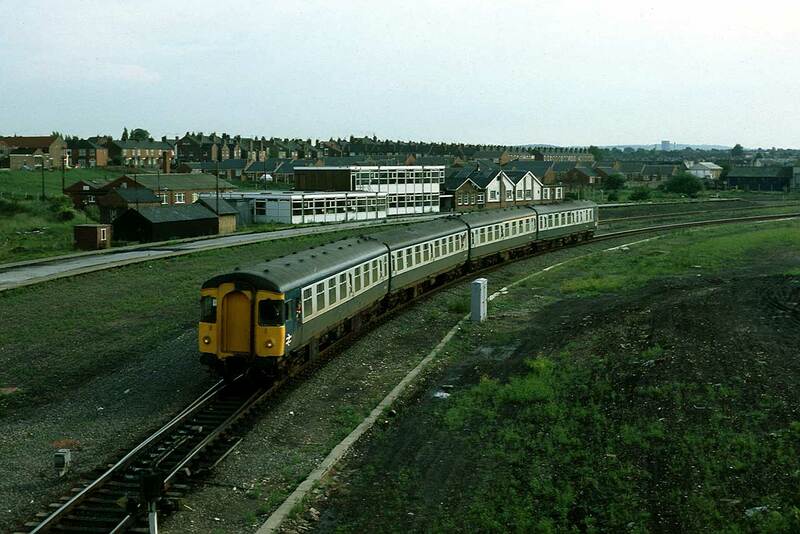 Also two of the Class 188 Trailer Corridor First cars remained in service throughout the 1970's and at least one was reclassified to a Composite. These four vehicles transferred to service on the Ayrshire line. A Trailer Corridor Buffet First survived into preservation. 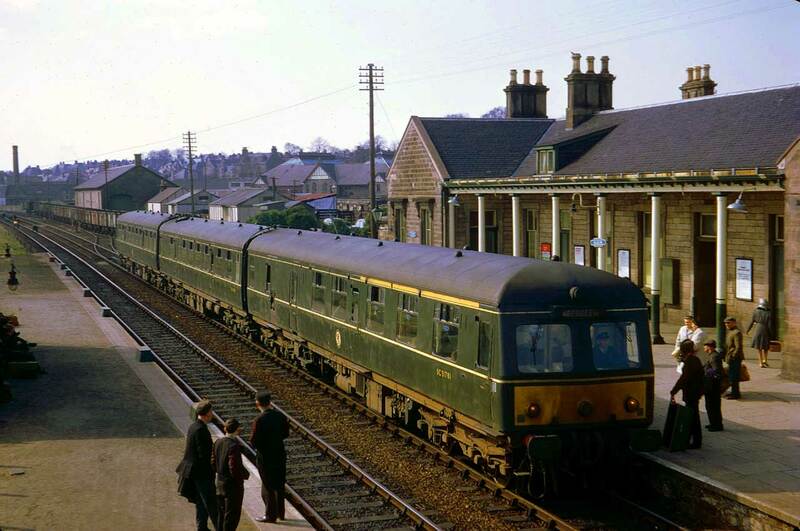 On the Aberdeen Inverness route the 1959 built Swindon cars were made up into three car sets consisting of a Driving Motor Brake Composite (51781-7) which had a full width cab and first class accommodation for 18 located behind the cab and a further 16 seats in second. The centre car was a Trailer Buffet Second (59679-85) with seating for 60 and 4 seats in the buffet. The last vehicle was a Driving Motor Second, again with full width cab (51788-94) and seating for 68. The route indicators on the cabs were of the roller blind type. 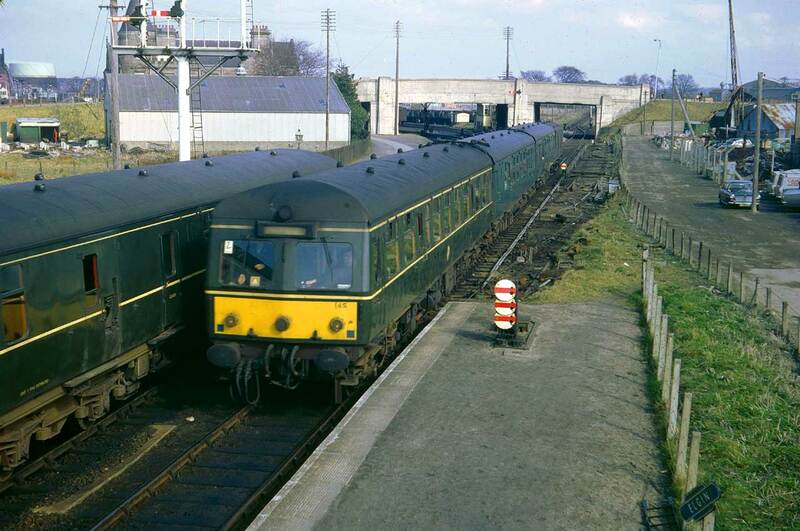 The motor vehicles were Class 120/1 and the trailer buffet cars Class 179. The route from Glasgow to Ayr and Stranraer employed the third variant of the Scottish Swindon units. These were also built in 1959. 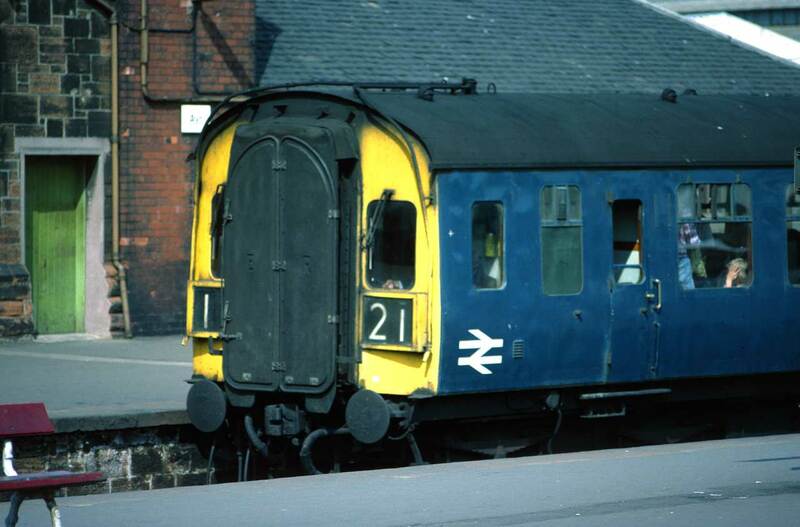 These were formed into three car sets consisting of a Driving Motor Brake Second with a full width cab with the guard's van being located at the opposite end of the vehicle, gangwayed at this end only (51030-51), seating for 52 and classified Class 126/2. The centre car was either a Trailer Corridor First with seating for 42 (59391-400) or a Trailer Corridor Composite with seating for 18 first and 24 second (59402-12). The centre cars were eventually reclassified to Trailer Corridor Second configuration. The trailers were originally designated Class 189 but around 1980 this was altered to Class 126, the same as the motor cars. The third vehicle was an Intermediate Driving Motor Second and gangwayed at both ends (50936, 51008-29), seating for 64 and classified Class 126/1. Again the route indicators on the cabs were of the roller blind type. Towards the end of their service the cab end gangway on the Intermediate Driving Motor Seconds was removed and plated over. As mentioned before, one unit was formed to include ex Edinburgh & Glasgow 1956-7 built Intermediate Driving Motor Brake Second (79168). This made it the only Swindon unit on the Ayrshire line that was gangwayed through both ends. 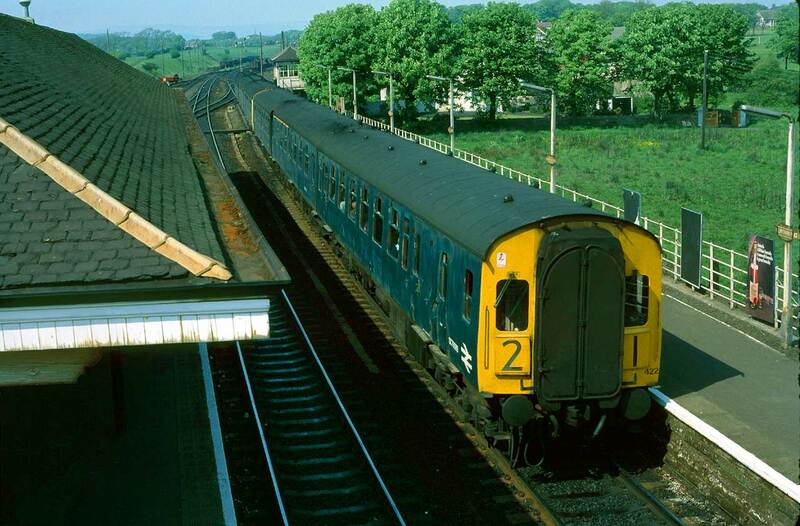 At least one of the regular Ayrshire Swindon Class 126 units lasted in revenue service until 1983 as one was used on the last day of service on the Glasgow Central to Kilmacolm line on the 10th of January 1983. One complete three-car Ayrshire Swindon unit survived into preservation. Here we see a Glasgow Queen Street bound set passing the site of Woodilee Hospital, just east of Lenzie. This is January 1969. 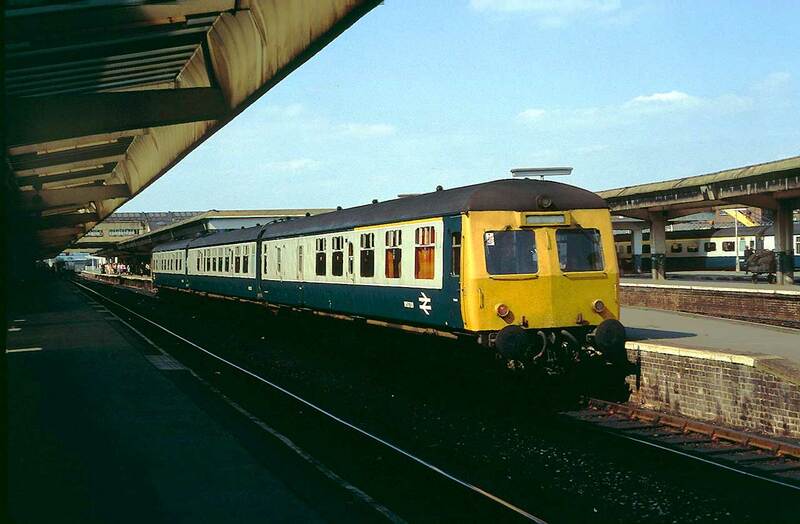 The first batch of Swindon units had stencil headcode indicators whereas the later ones had roller blinds. This is the surviving ex Edinburgh - Glasgow Intermediate Driving Motor Brake Second 79088 on a Glasgow to Ayr or Stranraer service at Kilwinning. Note the stencil headcode. Now this is Scottish Region. Check the background colour on the station nameboards. They are all in LMR maroon, not ScR blue. This is June 1977. Arriving at Elgin and we have just alighted from a Class 120 unit on an Aberdeen - Inverness service. April 1968. Elgin is a passing place for Aberdeen - Inverness trains. Whilst waiting to continue the journey to Inverness an Aberdeen bound train stops awaiting a clear line. April 1968. The Inverness train is arriving. Note that this unit has a van in tow. April 1968. On arrival at Inverness, another unit departs for Aberdeen. April 1968. 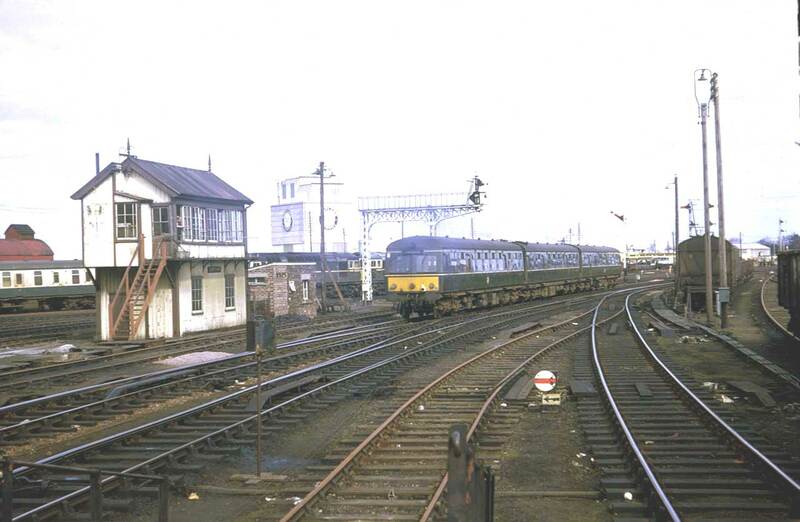 This is Inverness and an eight car set of vehicles is departing. You certainly do not get trains of this length operating on this service today. October 1975. Glasgow St. Enoch & Glasgow Central - Ayr & Stranraer. This Class 126 unit has just departed Paisley Gilmour Street for Glasgow. The electrification is for the Glasgow - Gourock & Wemyss Bay lines. July 1967. This unit has just departed Kilwinning. 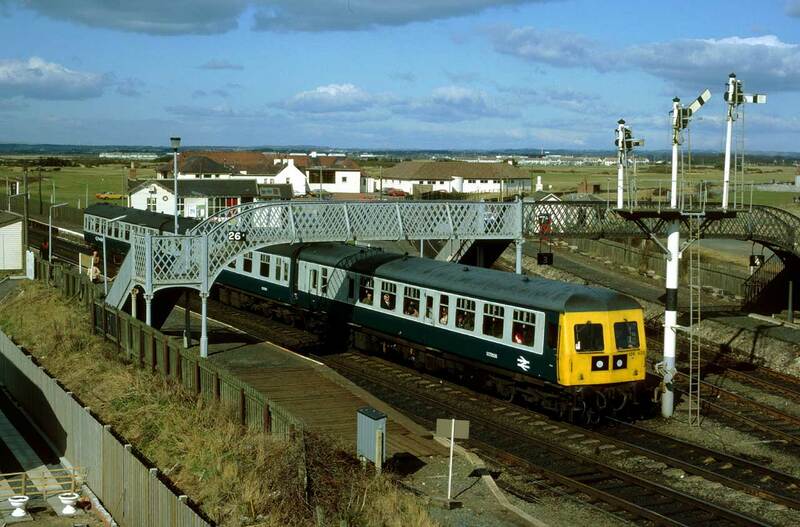 Just because Ayrshire Swindon units are through gangwayed at one outer end does not always necessarily mean they will be coupled with the gangways in the centre. September 1976. Journeys end at Ayr. September 1976. Ayrshires at Ayr. A couple of units are ready to depart for Glasgow Central. September 1976. Just east of Paisley Gilmour Street station is Arkleston cutting. 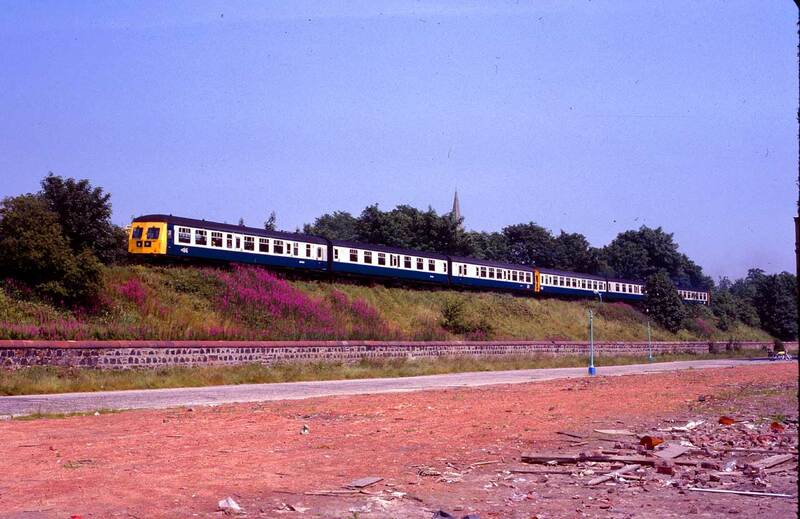 This is August 1977 and the leading Intermediate Motor Second has received its final colour scheme of Blue and Grey. On rare occasions units were not formed in the usual manner. Here one set has the Intermediate Motor Second replaced with another Motor Brake Second. the train has just departed Paisley Gilmour Street Station for Ayr or Stranraer. The date is September 1978. 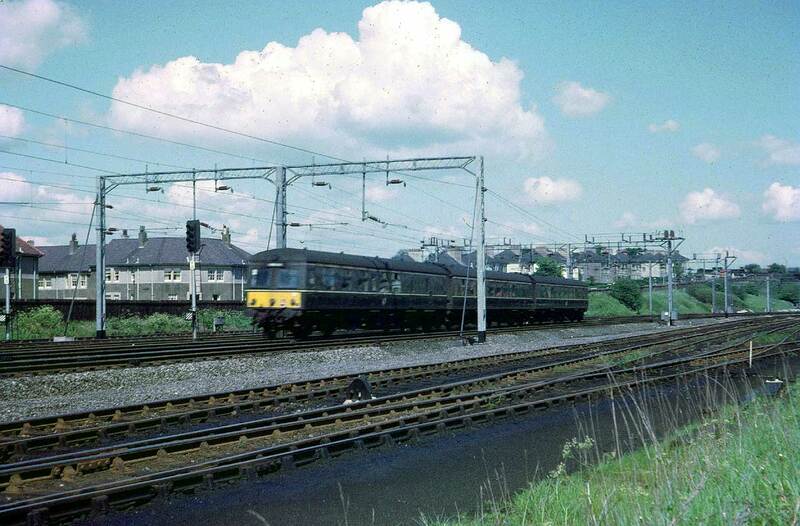 This is Barassie just before work started on resignalling and electrification. The unit is en route to Ayr via Troon. The line in the background is the line to Kilmarnock. April 1982. We are at Glasgow Central as a Class 126 arrives. In the 1980's the Intermediate Driving Motor Seconds became Driving Motor Seconds by the removal of the gangway connection, giving a somewhat sparse look to the units. June 1981. 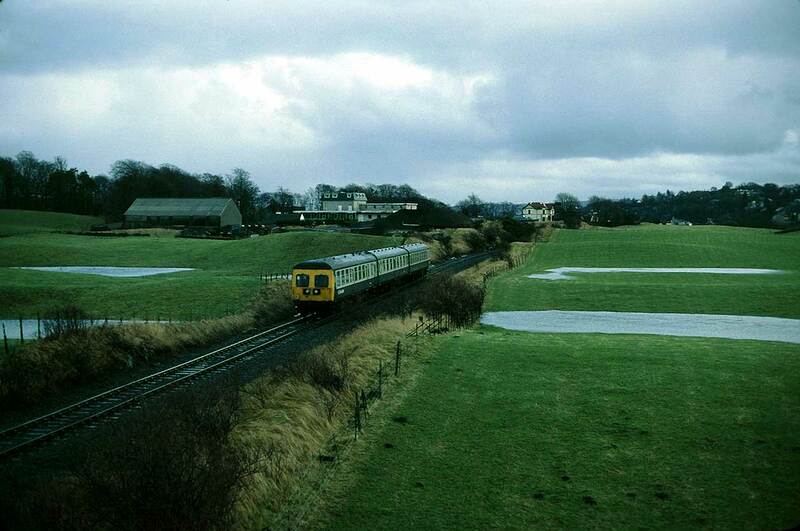 The last day of service on the Kilmacolm line. Class 126 units did not normally work the service but as it is one of the last trains to Kilmacolm, perhaps a special effort has been made. 10th January 1983. One Ayrshire Swindon unit survived into preservation. It is seen here at Brechin. August 1985. Restoration of the unit has been completed and the unit now resides with the Scottish Railway Preservation Society at Bo'ness on the Bo'ness and Kinneil Railway. October 2016. Not only but also..... Swindon DMU's in England. 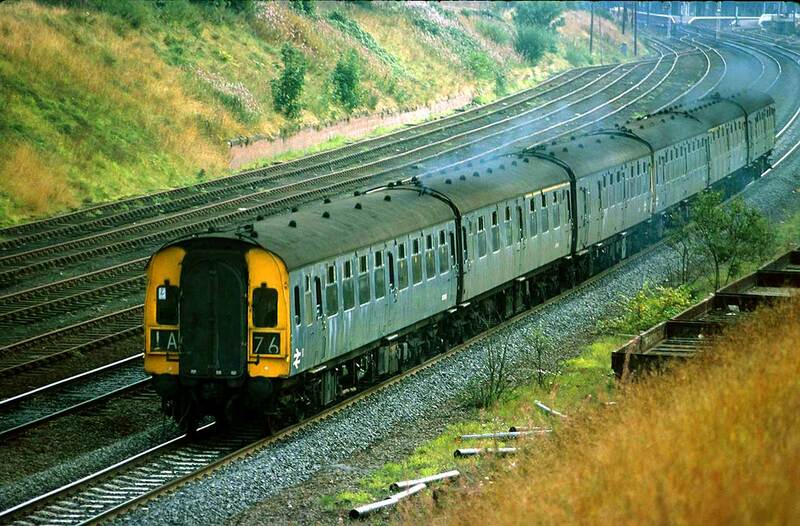 Possibly the most aesthetic and comfortable of all the Swindon DMU's were the Class 124 Trans-Pennine units. 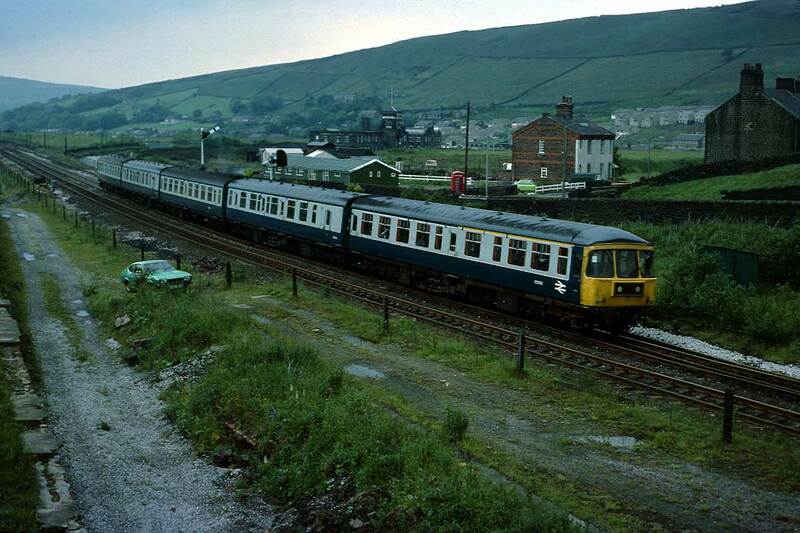 Originally six car, here one is seen minus its buffet car as it approaches Standedge Tunnel at Diggle. July 1977. A Class 120 unit at Derby. 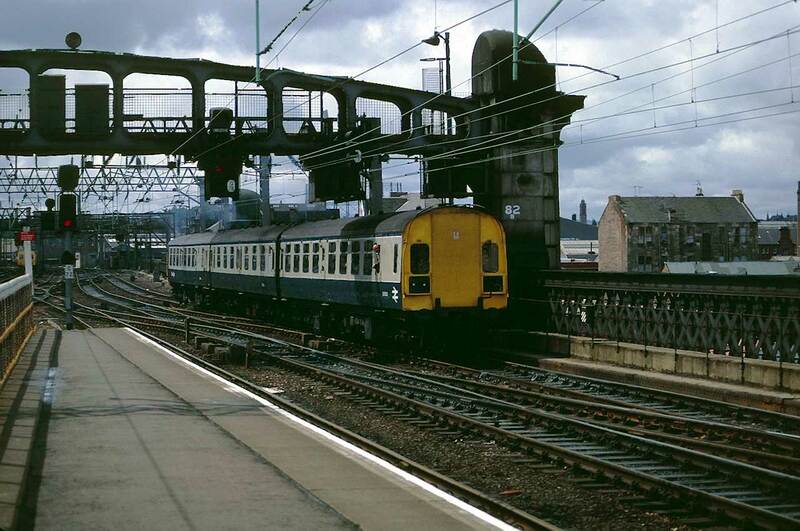 These units were similar to the ones operating on the Aberdeen to Inverness service. August 1980. Yet another type of Swindon Cross Country unit operated in England. 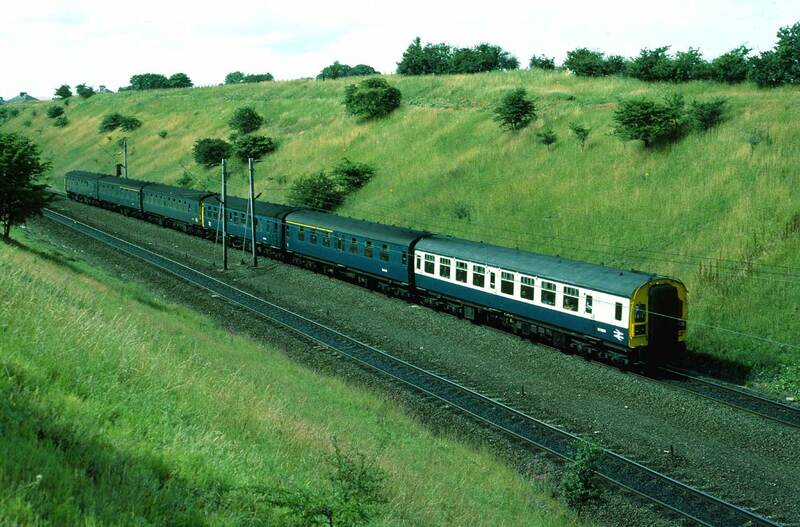 This is a Class 123 and it is approaching Doncaster. July 1982. Ready to run models in 00 scale are a bit scarce. Trix Liliput made models of the Class 124 Trans Pennine driving cars in both green and blue/grey. Unfortunately they did not do the correct intermediate vehicles. The only solution therefore is to build your own models from kits. Modern Traction Kits (MTK) did excellent kits of all the types of Swindon DMU but they do require a certain degree of determination and perseverance to complete. 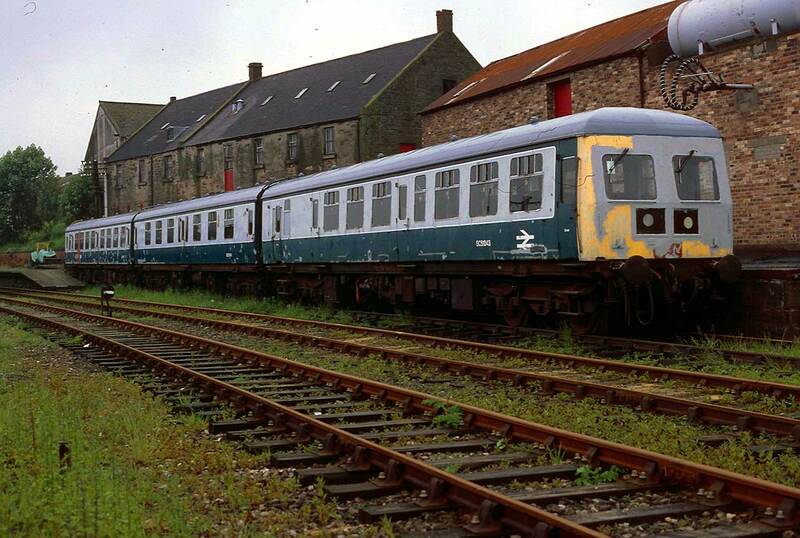 Made up models of the Ayrshire Class 126 units are shown. These operate well since they are fitted with Tri-ang power and trailing bogies throughout.